Where do you get your thrills? Some people may get if from climbing Mount Everest, closing a business deal, dangling from a bungee cord or running for political office. Not me. Those examples are no match to the thrill of watching and photographing magic moments with wildlife. Back in May, on a desolate road in Yellowstone, my adrenaline rush lasted a full hour as I watched a gorgeous fox hunting in snow. I could hardly stop from shaking the camera as I anticipated that the fox would jump and dive deep into the snow in search of another meadow vole. How is it possible that a fox can be walking on top of the snow and manage to hear a vole a number of feet away beneath the snow? Not only does the fox hear it, but manages to identify a location so precise to dive in and get it? 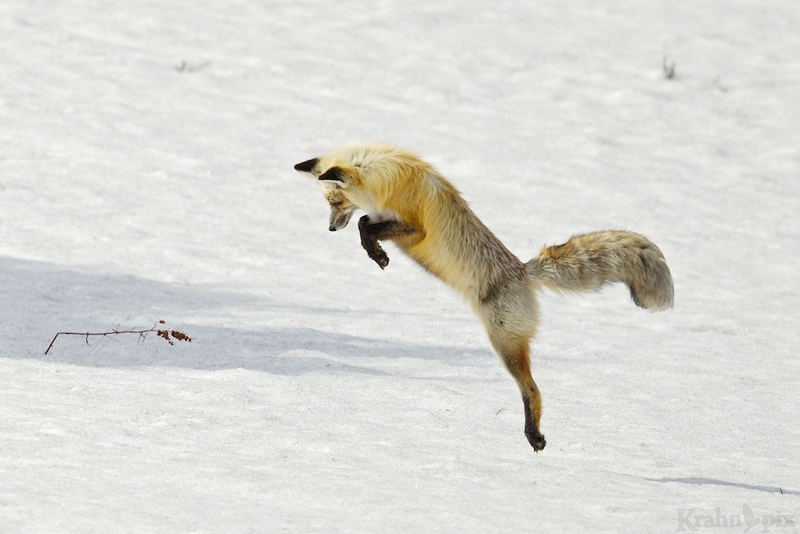 The beauty, grace and skill of the fox left me speechless. This is my favourite sequence of a successful hunt. I love the way the fox is tilting its head as it listens so intently. while extending that gorgeous tail. The fox’s paws move closer to the head to assist with breaking through the snow. Sending snow flying as it jumps back out of the hole it created. Holding on to the prize catch. Standing there with a snack as though it had just picked it off a shelf in the fridge. In some strange, and unbelievable way this was all normal activity. Now that was a thrill to watch!